In 1981 Bobbi Campbell was enrolled in a master’s program at the University of California at San Francisco with the goal of becoming a licensed nurse practitioner specializing in the health care of gay men. When he heard about a strange new disorder affecting gay men in San Francisco, he was eager to learn more. Bobbi Campbell, left, and his lover Bobby Hilliard help focus American media on the emerging AIDS epidemic in August 1983. In the fall of 1981 Bobbi became the sixteenth person in San Francisco diagnosed with the disease that would later carry the name AIDS: the Acquired Immune Deficiency Syndrome. About 400 miles to the south, Robert Bland was enjoying Southern California’s consistently mild weather after years of living in New York. A writer and editor for the Lesbian and Gay Rights Chapter of the American Civil Liberties Union, Robert was an articulate champion of social justice and an irrepressible optimist. 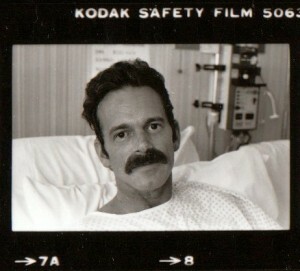 Like Bobbi, he had the misfortune of being among the early cohort of AIDS patients in the United States. As news of his condition spread on both coasts, it sparked an outpouring of concern from his wide circle of friends. He joked that he spent more time comforting distraught friends than the other way around. Robert Bland in August 1983, shortly before he died of AIDS complications in Los Angeles. Photo: Daal Praderas. I met both men in the spring of 1983 when the AIDS epidemic was just beginning to cause widespread anxiety in the gay community. The death toll from AIDS was accelerating alarmingly but the federal government showed little interest in confronting the disease. On May 22, 1983 I featured both Bobbi and Robert on a half-hour documentary that aired on IMRU, a weekly gay and lesbian radio program at KPFK 90.7 FM. It was the first time people with AIDS had been given the opportunity to tell their stories on a broadcast media outlet in Southern California. The program has been preserved by the ONE National Gay and Lesbian Archives at the University of Southern California. As far as I know, it is the earliest radio documentary on AIDS in existence. Bobbi, who would have turned 65 this month, died in August 1984. Robert died just three months after our conversation, in the late summer of 1983. An expanded one-hour version of the documentary, which I posted on this blog in May 2015, aired on KPFK on June 19, 1983. Although the version posted here is shorter, it contains audio not included in the one-hour version. Both provide insight into the emerging epidemic and the gay community’s struggle to understand and respond to it. 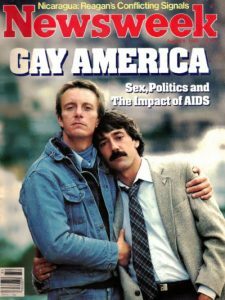 The week this documentary aired, gays and lesbians in Los Angeles and four other major cities in the United States held candlelight demonstrations demanding more government funding for AIDS research, launching the first wave of AIDS activism. my hat. off to them. Both of them were very strong people. Despite their own illnesses they helped others inflicted with the same disease. Bobby Hilliard? Is he still alive? No. Bobby Hilliard died of AIDS shortly after Bobby Campbell passed away. Hard to find out when, but yes he has passed on.